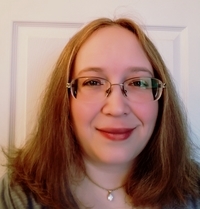 Shannon McRoberts writes epic fantasy and urban fantasy books while living in the rolling hills of Kentucky. Shannon is a lover of all kinds of fantasy but enjoys watching her collection of favorite shows like Xena, Buffy, Firefly, Game of Thrones, and Farscape. When she's not busy with taking care of her family, binge watching Netflix, or making fantasy art, she is at her computer weaving myths and magic featuring women of grit and steel. Get a FREE book when you subscribe to Shannon's newsletter! Get Exclusive pre-views in Shannon's Reader Group! Visit Shannon's Website for more information! To ask Shannon McRoberts questions, please sign up. "Firstly... I wanted to review this book purely on cover image love. I mean the colours and visual of this book is just stunning! So chapter 1 I was hooked. I hate long openings that go on so the fast opening pace really gets the story going. Apparently you are supposed to read this book and THEN the others that I have already read. Yet, I think I would have to disagree. I enjoyed the ending to this book more knowing what I knew about the other two books in this Shadow Tech Goddess saga. Apparently you are supposed to read this book and THEN the others that I have already read. Yet, I think I would have to disagree. I enjoyed the ending to this book more knowing what I knew about the other two books in this Shadow Tech Goddess saga. I think I would have felt different if I had read this one and then the others. I don't think it would be a bad thing, but reading them out of order suited my reading tastes. For the most part, you can read these Shadow Tech Goddess books in any order and you don't have to be super familiar with the League of Elder. These books are a fascinating take on alternate universes and time lines. Imagine creating a world and then creating it differently to make a whole new story line. These intricately woven tales about Lord Belmont and who or what he is in relation to the the universe keeps you reading. I really liked finding out what happened to Morgan-Jeterix. I rather like her. I do not like that HBS lady. I want to punch her. LOL. We’d love your help. Let us know what’s wrong with this preview of The Shadow Tech Goddess by Ren Garcia. In yet another astounding trip to an alternative universe we meet a different version of Lord Belmont. One where he is sad and a mere shadow of himself. Once again A-Ram and Alesta must save the day before the universe is ended. The book is full of i In yet another astounding trip to an alternative universe we meet a different version of Lord Belmont. One where he is sad and a mere shadow of himself. Once again A-Ram and Alesta must save the day before the universe is ended. The book is full of interesting mysteries and gripping action. Who is the woman with the purple visor? Is SHE the Shadow Tech Goddess? Who is the Woman with a Gun? And what's up with all those weird re-animated body parts? You'll just have to read Kat to figure it all out. Although this book is part of a series, I haven't read the books in any proper order. It in no way handicaps the reader to jump around. I read this book after reading Stenibelle. Currently I am reading The Shadow Tech Goddess, which I probably should have read first, but I did not. The author does a good job of giving you enough info to follow along without being one of those that repeats the previous book for an entire chapter. We’d love your help. Let us know what’s wrong with this preview of The 6th Turn by Ren Garcia. I love books that feature lead lady characters. I had previously read the first League of Elder book when I was told to check out this book because I like strong female leads. I was a bit hesitant to read it since I had not read the entire series yet I love books that feature lead lady characters. I had previously read the first League of Elder book when I was told to check out this book because I like strong female leads. I was a bit hesitant to read it since I had not read the entire series yet, but I was surprised by how easy it was to follow along. Anyone could pick up this book and enjoy the plot without knowing too much about the series. I do feel that reading at least the first book in the series will help the reader enjoy the story a bit more so you know what a Vith is and a bit of the history of the universe that Ren has created. It's an engaging sci-fi/fantasy read and I finished it in about four hours. It's shorter than some of the other League of Elder books and has a lot less of the history to sort through. It's paced well and the writing helps create the story in your head as you read along. The only thing I could complain about is that the book kind of ends on a somber note. It's hard for me to articulate. You get a sense of closure, but it just didn't feel like all the closure I wanted for Stenibelle. The ending isn't a cliffhanger nor is it a flat out sad ending, but I think there is room for the author to write more about Stenibelle. In fact, I wanted a few more chapters at the end of the book giving me a bit more information on what she did after everything was said and done. Of course, that may just be my personal preference. We’d love your help. Let us know what’s wrong with this preview of Stenibelle by Ren Garcia. Once again Richard W. Haines has sent me a fun book to read. Although this does feature a few of the people from his 24-Frames Per Second Thrillers, it has a different approach than the other novels in the series. For a good while, until Patty and "T Once again Richard W. Haines has sent me a fun book to read. Although this does feature a few of the people from his 24-Frames Per Second Thrillers, it has a different approach than the other novels in the series. For a good while, until Patty and "The New American Times" showed up I wondered if there was anyone from the other books in this one. I did enjoy the book and it was a real page turner with its mystery. I needed to know more about Bradach because I felt there was something off about him from the first time I read about him. I am not a big "horror" fan, but this wasn't too much horror for me to dislike it. I was, however, disappointed by the ending. It wasn't a bad ending, but I didn't get the closure I wanted. Yet, it was fitting for the overall book and knowing Richard's past as a movie director and the genre he worked in it really does make sense to me why he did what he did. I have little to no words to describe the love I have for this book. I really liked the characters and the backgrounds. There was only 1 chapter in the whole thing that I did not enjoy, but that's just me. This book introduces you to the world of Eld I have little to no words to describe the love I have for this book. I really liked the characters and the backgrounds. There was only 1 chapter in the whole thing that I did not enjoy, but that's just me. This book introduces you to the world of Elder and makes you want to know more about the "blue" and "brown" caste system Ren has set up. Action, adventure, romance, lust, and super cool powers in an alien retro-futuristic world. Looking for brave women? Looking for dashing heroes? How about a talking seal creature? This book has it all. Oh and there are beings that eat stars and crazy princesses in war make-up. We’d love your help. Let us know what’s wrong with this preview of Sygillis of Metatron by Ren Garcia. Vampire aliens, Superheroes with BITE! Book series about warriors of virtue aimed at young adults/adults. Welcome to GoodReads Shannon! I'm glad that you have joined the rest of us here and look forward to following your news and comments!